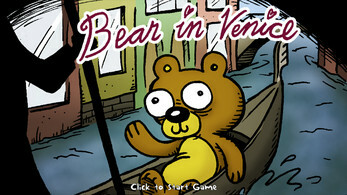 Bear in Venice is a very short adventure game about a teddy bear's desire to ride a gondola. I hesitate to call it a "real game", since it probably takes less than ten minutes to finish, but it's a completed game, so here it is. This is my first game made with AGS, so it was a short practice project to begin with. It was a fun experience, and I'm writing a longer game at the moment. Because you renamed the executable after compiling, winsetup searches for a bearinvenice.exe. You can change the filename in the AGS editor and recompile it though. You can change the filename in the AGS editor and recompile it though. Not filename, but the project folder name! This is an undocumented "feature" in AGS Editor , the name of exe it produces equals to the name of the game project folder. Thanks, it should be fixed now! Looks cute! Congrats on the release. It's a cute little game. The art is lovely. 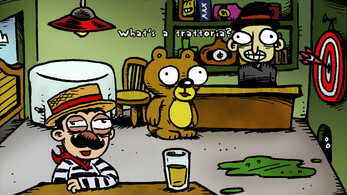 After the gondola guy has told the player what he's supposed to be doing, the dialog option should probably change from "But I really want to go!" to something like "What was it you needed again?" I was able to stab the gondola guy before I knew why I was doing it. It might've been a good idea simply to have the bear say something like "Why would I do that?" until having spoken to the cop. Anyway, those are minor points. I look forward to seeing more from you! Yeah, those are good points. I'll definitely pay more attention to details like that when I'm working on my longer new game project, now I just couldn't wait to get my first game out there quickly. I could complete the game without any trouble and the graphics were really great!